The Medicinal Herb Info site was created to help educate visitors about the often forgotten wisdom of the old ways of treating illnesses. Many of today's drugs and medicines were originally derived from natural ingredients, combinations of plants and other items found in nature. We are not suggesting that you ignore the help of trained medical professionals, simply that you have additional options available for treating illnesses. Often the most effective treatment involves a responsible blend of both modern and traditional treatments. We wish you peace and health! Horsemint is a native strongly aromatic biennial or a short-lived perennial plant 1-4 feet tall; the branched, round four-angled, stem bears opposite, lanceolate, downy leaves dotted with small depressions. The two-lipped flowers, like gaping mouths, are yellowish with red spots and grow in successive axillary whorls subtended by large, white-lilac, lance-shaped bracts around them. July to October. Other varieties: Oswego tea (M. didyma) and Wild bergamot (M. fistulosa); also called horsemint (M arvensis) which is more common in India. Found mainly in the eastern and central United States. Likes dry places and on sandy soils; on the coastal plain from New Jersey to Florida and Texas, also further west from Michigan and Minnesota south to Missouri. Horsemint tea can be taken for flatulent colic, suppressed urine, diarrhea, rheumatism, and digestive and other stomach problems such as nausea and vomiting. Native Americans used the plant for fever, flu, catarrhs, chills, decreased menstrual flow, and inflammations. One tribe drank a cold extract to relieve backache, and another to stimulate heart action. The oil derived from the leaves promote sweating when rubbed on. Oil high in thymol expels worms. Thymol, now manufactured synthetically, was once commercially derived from thyme (Thymus species). 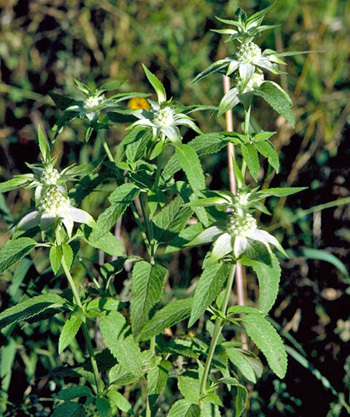 During World War I, commercial thyme fields were destroyed in Europe and horsemint was grown in the United States as a substitute source of thymol. Horsemint is efficient in the control of vomiting due to exhaustion, persistent nausea with flatulence, or vomiting of alcoholics in whom it will impart a temporary tone to the stomach. Infusion: steep 1 tsp. leaves or tops in 1 cup water. Take 1-2 cups a day. 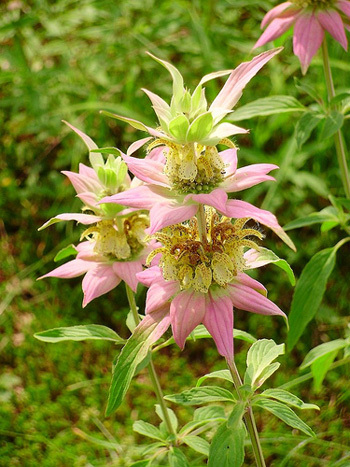 Oil of horsemint, diluted with soap, can be rubbed on to alleviate the pains of rheumatism and backache. Take 10-30 drops of the tincture daily in a glass of water. The Herb Book , by John Lust, Bantam Books, 666 Fifth Avenue, New York, NY. copyright 1974. The Yoga of Herbs: An Ayurvedic Guide to Herbal Medicine , by Dr. David Frawley & Dr. Vasant Lad, Lotus Press, Twin Lakes, Wisconsin, Second edition, 1988. An Instant Guide to Medicinal Plants , by Pamela Forey and Ruth Lindsay, Crescent Books (January 27, 1992). The Magic of Herbs in Daily Living , by Richard Lucas, Parker Publishing Co. (1988).